Spring season starts Saturday, 4/1 for all children born in 2009 or later. All divisions play at Allen Park. 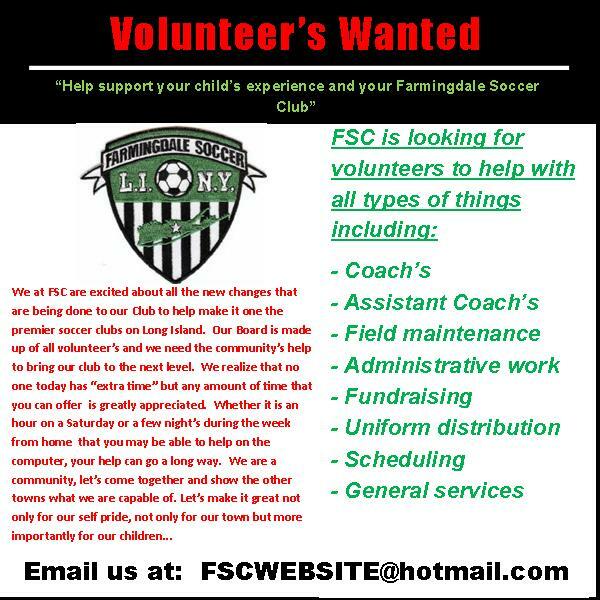 Exciting news: Farmingdale Soccer and Adidas Soccer will partner to supply Farmingdale Soccer with new uniforms. Each uniform kit includes a jersey, shorts and socks. Welcome to our online registration system for SPRING 2017. BALL - 2014 TO 2010 SIZE 3 AND 2009 AND OLDER SIZE 4...PUT YOUR NAME ON YOUR BALL!!!! 2014's and2013's play at Allen Park on Saturday mornings at 9:00am, 10:00 am or 11:00am (need to select). Our 2014/2013 program is designed for the child and one parent. The session will last about an hour. 2012's play at Allen Park on Saturday mornings at 9:15am, 10:15am or 11:15am (need to select). Our 2012 program has a 30 minute training session and a 30 minute practice game session. 2011's play at Allen Park on Saturday mornings. The boys start at 9:00 am and girls start at 9:45 am. You will receive a 40 minute training session each week provided by a professional trainer and then play a 3v3 game after training. 2010's play at Allen Park on Saturday mornings. The girls start at 10:30 am and the boys start at 11:15 am. You will receive a 40 minute training session each week provided by a professional trainer and then play a 3v3 game after training. 2009's will train and play games on Saturdays at Allen Park - Girls start at 12 noon and boys at 12:45pm. You will receive a 40 minute training each week provided by a professional trainer and they play a 6v6 game after training. Please note that all coaches can hold additional training sessions as they see fit during the week. IMPORTANT- ALL NON-FARMINGDALE SCHOOL DISTRICT FAMILIES MUST PAY A $60 OUT OF DISTRICT FEE( THIS IS PER FAMILY FEE - ONCE A YEAR FROM AUGUST TO JULY. THIS FEE DOES NOT APPLY TO SOCCER CAMP REGISTRATION. YOU DO NOT PAY THE FEE IF YOU PAID IT FOR ANOTHER SPORT IN FARMINGDALE. THIS FEE WILL BE COLLECTED WHEN UNIFORMS ARE DISTRIBUTED. Congratulations to the GU10 Sky Blue United on a second place finish in their first ever tournament! Congratulations to the GU12 Farmingdale Rebels United on a 1st place finish at HBC tournament! GU15 Stars United East Meadow Tournament Champions second year in a row with 4 shut out games! Farmingdale Lightning LIJSL Fall 2016 Division Champs! Congratulations to the Farmingdale Lightning on being the Division Champions for their LIJSL season!